UBC has partnered with Casio to introduce the first electronic cash register with integrated credit card processing. This exclusive technology now delivers the ultimate payment solution and its yours free of charge. This integrated technology is the first of its kind and eliminates the need for a separate credit card terminal at your business location. You will now have the ability to handle all transactions directly through this advanced ECR. 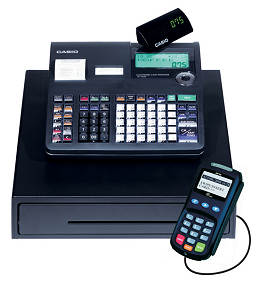 Casio TE 1500 This stylish and functional cash register was designed specifically for the retail environment. Thirty department keys will be customized to meet your particular operational needs, offering the capability to store up to 2,000 PLU numbers. This electronic cash register is the ideal solution for all retail businesses and comes complete with cash drawer and backlit customer display. The Casio TK 1550 electronic cash register is designed with the most demanding restaurant environments in mind and is built with a flat membrane keyboard to withstand liquid spills, dirt and other foreign particles. Each cash register comes complete with an integrated PCI PED compliant credit card payment terminal to enable fast and user friendly payment options. This secure device supports either dial-up or Ethernet connectivity and its sleek, compact design fits easily in the palm of your hand. With a wide array of convenient features, it is the perfect device to streamline your electronic payment system. No Locked-In Contracts or Cancellation Fees - Risk Free! Sign up for our credit card processing service and UBC will provide you with a brand new Casio state-of-the-art cash register, free of charge! As an added incentive, we will also provide you with one year supply of receipt paper. That's incredible value, at no cost to you! Your Casio cash register will arrive preprogrammed from UBC Services in as little as 48 hours and will simply need to be plugged in to a power outlet and phone port to be ready for use. The terminal will automatically connect to UBC Services's network and you can begin accepting transactions immediately!